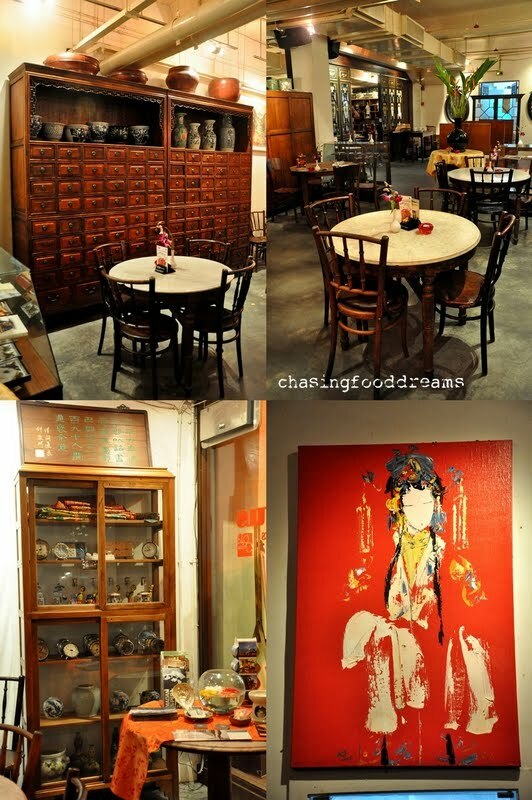 CHASING FOOD DREAMS: Precious Old China, Central Market Kuala Lumpur: Old Charm with Great Peranakan Dishes! Precious Old China, Central Market Kuala Lumpur: Old Charm with Great Peranakan Dishes! 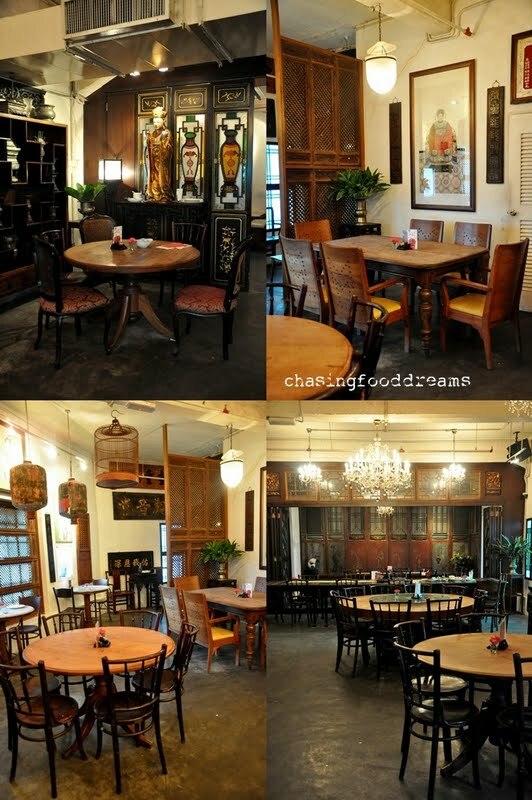 The Best of Both Worlds of Antique and Nyonya! My recent food excursion landed in Central Market, Kuala Lumpur. It was probably the last place I would visit for food since I usually try to avoid that traffic laden area. However, a little bird told me there is a lovely Nyonya restaurant that has been around for a while serving up delicious Nyonya favorites. Whipping up my partner and another foodie, we brave the traffic on Saturday for lunch and to my luck, it was smooth sailing all the way! Now we found out a little more about Precious Old China since my friend knew the owner. 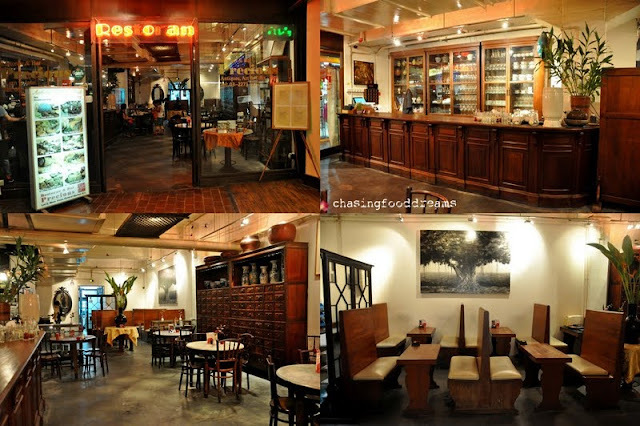 This six year old restaurant is the 2nd branch of its original 16 year old Old China located nearby Petaling Street. Both restaurants are the brainchild of by an avid antique collector and a travel tour guide who combined their passion for antiques and Nyonya cuisine. Walking into Precious Old China, it’s like travelling back in time. The atmosphere evokes an old era that has remain timeless. The décor is made up from lots of antiques, a collection that both owners have been collecting all their lives in their travels. Some of the pieces are really impressive, from its Chengal hardwood doors and bar, huge teak cabinets, various mixed of antique wooden furniture, old chandeliers, wooden lattice panels and so much more. Color glass windows, crystals from chandeliers, bold huge artworks and collections of pewter ware are just amazing and perfect for photos. One can see how much effort goes into maintaining all these antiques, it’s just a sight to behold for everyone! Food is authentic Peranakan dishes with a combination from Northern and Southern. 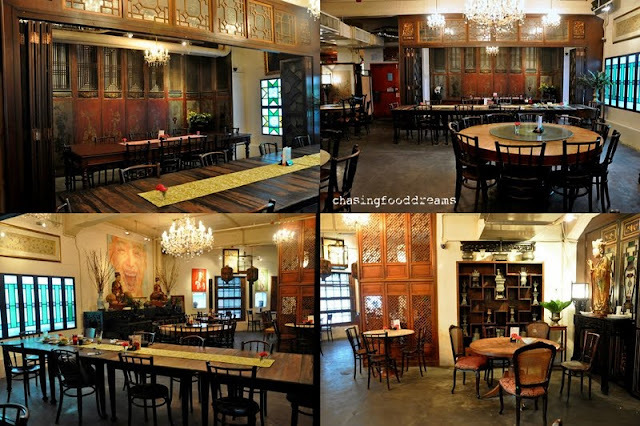 The menu features a great range of Nyonya dishes, snacks, single dishes, soups, and desserts. Everything bit is made from scratch! Thin crispy top hat shells, jicama filling and spicy chili sauce are made in house. Simply fill up the golden shells with sweet crunchy jicama filling, add a bit of crumbed bean curd, a dollop of chili sauce and coriander leave. Pop these into your mouth at one bite if you can for the full sensation. Crispy, sweet, a little spicy, it’s a snack that never fails to please me when it is made just right! Instead of using the smaller prawns, Precious Old China goes lavish and goes for the big ones with shells on. Flavors are certainly good with a nice balance of spicy, sweet and savory. My only tiny gripe is that there is hardly any spicy sambal gravy on this dish to coat the petai and of course to smother my rice. Luckily for me, there is pool of gravy in this dish. It’s a burst of spices and the flavors are gorgeous. The tamarind curry gravy is superbly sour and spicy. I can taste loads of lemongrass, shallots, chili, ginger torch and the piquant tamarind all nicely balanced after a good simmer. Now the norm would be a glorious fish head in this one but there is a choice of fish fillet and fish head. We went for the fillet, feeling a little lazy. We got quite a few pieces of thick fillet, blanched lady’s finger and fried soft eggplant pieces. As usual, I flooded my rice with the gravy. Yummy! Though one can have white rice, we definitely love the coconut rice. Fluffy and rich from coconut milk, it is even tinted blue with the butterfly pea flower to get that authentic touch. The rice goes really well with the Beef Rendang and Asam Fish Fillet. Forget the white rice and go for this as an indulgence. I can only take my other foodie’s ravings that this dessert is awesome since durian is my nemesis. Oh well, if there is one thing that is obvious, I can smell this dessert even after it was placed far away from me…goes to show how much creamy durian flesh is served with steamed soft glutinous rice and a good dollop of thick cream coconut milk. Now this is my kind of dessert! All-time favorite wobbly sago floating in a creamy white coconut milk and lust up with syrupy thick Gula Melaka. Since the Gula Melaka is served separately, one can control the sweetness of this dessert. I am going to cut the chase and sum up this dessert in one word… Awesome!! Our drinks for the lunch are Roselle (RM6.90), Sour Sop (RM6.90), Sour Plum (RM5.80) and Iced Local Coffee (RM6.90). We love the Roselle made in house and the local brewed thick and creamy iced coffee. *Psst… Old China, the original restaurant serves pork, wink! I really enjoy their laksa. Place looks great! I super-love nyonya... Slurpsssss!!!! Oh! at central market, I think prices is ok. what a photogenic deco, really worth a visit for taste and sight ! So pretty la, the dishes! And you are right, why so little sambal in the prawn petai dish?!! I like the environment, the ambiance. Looks like a nice place to have some authentic peranakan food eh. I really like the decor of this place, I think this one of those places where u step in and can truly say it is "one of a kind". I would love to have some of those "antiques" in my house. Maybe I can just hop on to the LRT and get to this tourist spot! I want to try the dessert. went to this place quite some time ago but didn't have any food. love their interior! now I see this post and I think I should revisit them again! Wow! Just the deco itself has convinced me that the owner of this place has so much passion in Peranakan culture. Food-wise, it must be extra-gastronomic!